Over the weekend, Chrome announced a collaboration with DKLEIN and here’s a video about it. Perhaps you’ve wondered like me what Chrome has been doing since they were bought by Keen? It’s been a few years and we didn’t get any water sandals with a griffin logo on them. There is a new bag, and a few other items, but not any major updates or new lines. Chrome is in the fashion business where being on trend is essential. Getting Dustin into our mix is going to lead to all sorts of fun things. He’s got a creative style that stands apart yet straddles the cycling and art circles, and I’ve always looked forward to seeing how he brings new product ideas to life. While we’ve got something of a roadmap of what we’re going to do together- from graphics to altogether new styles- I suspect that the unmapped roads we’ll come across are going to be the most rewarding for us to bring together. I hope the new roads follow what’s happening in the adventure space and pays attention to what cyclists are doing with large-volume tires on dirt roads. If it does, there’s sure a market there for fun and getting out for big miles. Klein’s work in the bike space includes embellishments like this one and while interesting I’m not sure where that fits into a larger, established brand like Chrome who hasn’t driven headlines in several seasons. I’m very interested in what and if we’ll see Chrome work with Klein on the road+ category like maybe custom OPENs or bringing style to say a Surly. If it’s limited to graphics, maybe not? 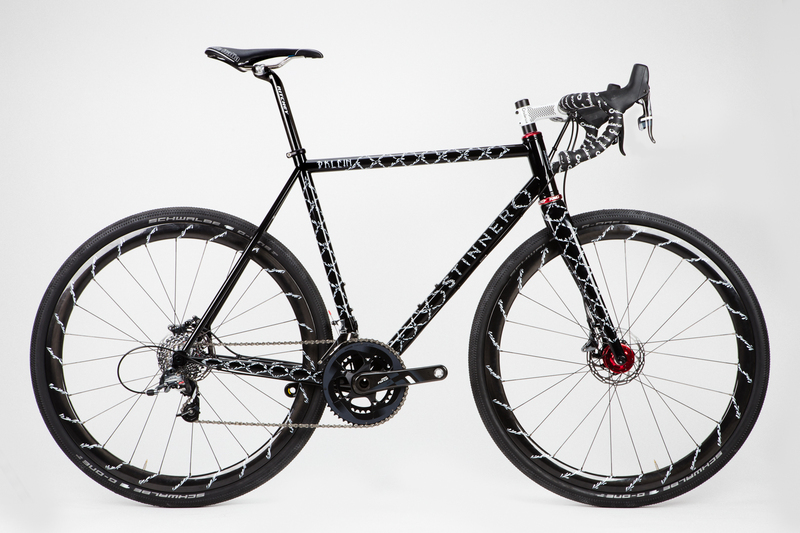 As you can get a bike custom made and painted with your own embellishments, whatever they are.